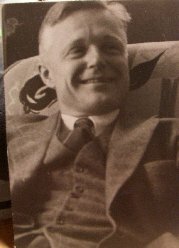 For the past 30 1/2 years, i have been waiting to retrieve some of the pieces of the death of my beloved Father, Roger Sherman Baldwin Whitney M.D. 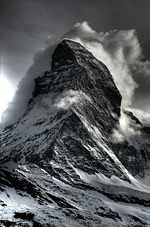 ; he was lost in a mountain climbing accident in Peru, the summer of 1965. This is an attempt to bring it together in some coherent manner, with as many of the details that i am able to discover. i presume this will be an ongoing project for quite sometime, and i am feeling so very blessed that things have fallen together the way they have. Thank You Lord!!! The very exciting news is that i got to meet Will Steger Sunday evening, and the timing was positively Divine! 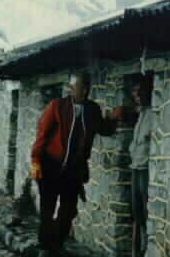 For the past 3 years, ever since i learned that he was on the expedition in Peru where Daddy died, we have been trying to find a chance to talk. 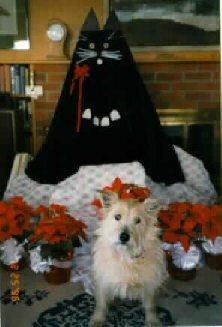 Just 4 weeks earlier, January 8,1996, I lost my beloved Cattledog, Scrapper, to a strange auto-immune disease, which gave her hemolytic anemia; her own immune system was eating up her red blood cells. According to the blood tests, her bone marrow was turning out new red blood cells as fast as it could, but they were of the immature variety, and the numbers just weren't keeping up. She even had an all-day blood transfusion --- nearly 1000 cc from her Cattledog buddy, Frank, who belongs to our friend and vet, Murt Byrne, but to no avail. 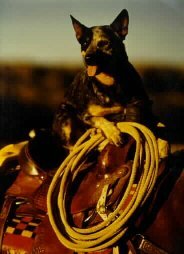 She has been my best doggie ever, my 24 hour a day, most loving and faithful friend and companion, my Heart Dog for nearly 9 years. She adored me from her very first day in my life as a tiny puppy, and all she ever wanted to do was please me, be with me no matter where i was, and be a perfectly obedient, fun, and happy companion. Her loss affected me second only to losing my Father. Having never had children of my own, she was the closest thing that i could imagine; and now i completely have an empathy of the pain which parents feel at that most terrible loss of a child..... All the grieving, and torrents of tears those first few days after she died seemed also to be for Daddy, for i found myself thinking of him a lot, missing his love and guidance, and feeling such great losses. i was Daddy's girl, and quite the tom-boy. We puttered around together, building or doing this or that (from these early experiences stemmed my confidence to tackle my own house-building as well as other wild projects!! ), 'teased' the bees (he set me up with a little booth by the road to sell honey, and his specialty, creamed honey--made by adding special finely-crystalled honey, which would 'grow' and 'cream' an entire batch), went skiing (mostly on Pikes Peak), watched Sky Sox baseball games, listened to the Brooklyn Dodgers on the radio, Red Barber calling the plays; he loved the night sky and the stars, and taught us many constellations; and on several winter nights, he would awake us to see the Northern Lights in the early morning hours!! 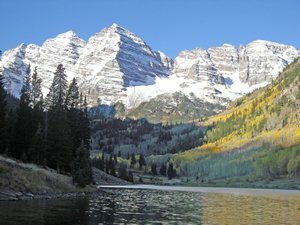 There were many hikes and camping trips every year, and lots of picnics to Taryall and Wilkerson Pass east of South Park, west of Colorado Springs. I was blessed to have been able to climb on Mt.Whitney and the Matterhorn with him! Anytime my hands would be too cold, he'd put one under each armpit; instant warm for me, great loving discomfort for him. He let me drive the car when i was young, out on the lonely desert roads going to visit relatives in California, and took me for my license at 8 am the morning of my birthday!! And he had a fabulous compost pile, which he lovingly tended each year. Soon my horse added precious humus to that pile! Our 'deal' was that i would fill the manure cart, and he would dump it on the compost pile. How beautifully grew his huge iris collection, as well as his carrots, beets, and corn, along with Ma's great rock garden. When we were little, my brother and i would sit with him in his big blue chair, one on either side, and he would read to us, night after night, while Mom knitted and listened too. The Tall Book of Make Believe, and especially the story 'Bad Mousie,' was a favorite. Garth Williams' incredible illustrations piqued our imaginations as well!!!!! Daddy was a prolific writer, and sent lots of little notes to his various friends, just to say 'hi!' and keep in touch. Even though we weren't as close during my teen years, i always adored him, admired him (and he was so handsome! ), and wanted to be daddys-little-girl again... To this day, his friends, family, and old patients still remember him in great detail and with much fondness. i was indeed blessed to have such wonderful, loving parents who believed in me and encouraged me, knowing i could do anything i put my mind to. Along with my extended family from the Whitney and Bradley clans, i couldn't have asked for better!!!! Hallelujah!! I am most likely a New Mexican today because of childhood trips; to Taos when there were only 600 people, visiting a medical school friend, Br. 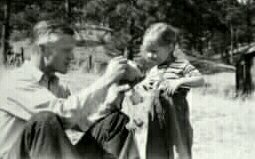 Ashley Pond III(1908-1986), Founder in 1942 of the Pond Clinic in Taos. How I loved the adobe houses and the pueblo, the dirt roads, and the great variety of animals wandering all over! And visiting another medical school friend, Dr. Shipman in Pojoaque. A child's dream world---cottonwood lined driveway, and gorgeous old adobe house with myriads of rooms going here and there, plenty of secret hide-a-ways!! I loved the vegetation too, and always felt really comfortable here. 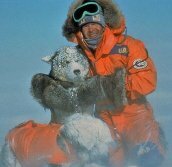 Will Steger is the man who completed a 2000 mile trek across the Arctic, March-August, 1995, arriving at the North Pole on Earth Day, where there was a great celebration. Named the International Arctic Project (IAP), he traveled with 3 other men and 2 women, from 5 different countries. Will was the oldest of the group, the youngest being 20 years his junior. He has done many Arctic treks and explorations, and Shaklee Corp. has been his major sponsor for over 3 years, as well as his nutrition advisor. They developed "Will Power Soup" for the trip; a mere 750 calories per serving! But they needed around 6000 calories each day, so special meals were developed! They were on the internet for their entire trip, and talked to school kids every day. i received the daily faxes of their progress and conditions, and was glad to be in my warm home!! But more on that later. Will was involved in three 'first ascents' by new routes of peaks over 18,900 feet in the Peruvian Andes, and had arrived somewhat earlier. Being only 17 when Daddy died (and my brother, Ed, only 15), i either didn't know how to find out more, or was in just too much pain to expose myself to more pain-through-knowledge (or whatever it was!! ); so for nearly 30 years i hadn't tried to search out more details. What i knew was really quite sketchy, and i had carried this vague information around all those years. Then something really miraculous happened! 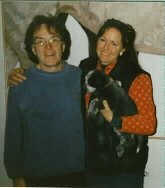 Right after my next door neighbor, Susan Hertel (that fabulous painter of horses and animals, lover of people and the earth, and my wonderful friend), died in March 1993, her daughter, Clare, and i were talking and crying on her porch, sharing the loss of our parents. Clare worked for Shaklee in the Public Relations dept. for several years, and she was the chief PR person for all of Will's Shaklee- associated trips. Her first assignment for Shaklee was PR for the Daedalus Project---the first totally man-powered flight of a small airplane the 76 miles from Greece to Santorini, following the path taken by Daedalus and Icarus in Greek Mythology. Shaklee Performance Drink was specially formulated for this historic voyage; such a great need to supply muscle fuel and hydration for the severe physical stress! Performance was a major part of Will's rations too!!! In 1993, Will established the IAP, and planned several training expeditions in preparation for the big trip in 1995; this was when Shaklee became involved as one of the Founding Sponsors, as well as the dietary advisor to help with the nutrition needs in such extreme conditions!! Clare was there when they left from Russia, and also when they arrived back in the North West Territories, as well as other wonderful events related to the various expeditions. As we sat and talked, i told her of losing my precious Daddy to a mountain in Peru in 1965. Clare said this had a really familiar ring to it!! When she first met Will, they were talking about how he became involved in Arctic exploration, dog-sledding, and the environment of the far North. He had told her that he was once interested in mountain climbing, but 2 of his friends were killed in the summer of 1965 in Peru, and he decided then to pursue Arctic exploration rather than mountain climbing. Whether he thought mountaineering was more dangerous than Arctic exploration, or just took the accident as a sign, i have yet to ascertain! !